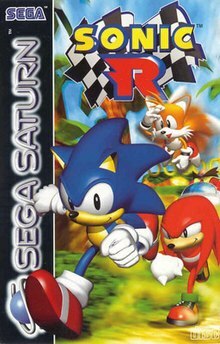 Sonic R[a] is a 1997 racing video game developed by Traveller's Tales and Sonic Team and published by Sega for the Sega Saturn. The player races one of ten Sonic characters in various Sonic-themed race tracks as they attempt to stop Doctor Robotnik from stealing the Chaos Emeralds and enslaving the world. Sonic R is the third Sonic racing game, and the first in 3D. It was the second collaboration between Traveller's Tales and Sonic Team and was developed over nine months, designed to take advantage of the Saturn hardware. Sonic R was the only original Sonic game released for the Sega Saturn; Sonic 3D Blast is a port of the Sega Genesis game, and Sonic Jam is a compilation of the first four Sonic games. Sonic R was praised for its visuals, but its controls and short length were criticised, and its soundtrack, composed by Richard Jacques, polarised players. It was rereleased for Windows in 1998, and for the PlayStation 2 and GameCube as part of Sonic Gems Collection in 2005. Sonic R is a racing video game with single-player and multiplayer modes. The player selects a character and participates in a footrace on one of five race tracks, competing for the fastest time ahead of the other racers. Four characters are initially available, while the other six are secret characters that become available when the player completes certain in-game objectives. Although the gameplay is considered similar to kart racing games such as the Mario Kart series, Sonic R places an emphasis on jumping and exploration, as each track has multiple paths and hidden areas. The tracks, although original creations, are thematically based on the art style and environments of classic Sonic games such as Sonic the Hedgehog's "Green Hill Zone" and Sonic the Hedgehog 2's "Chemical Plant Zone". During each race, the player is able to collect items scattered across the track, bestowing advantages. Rings, a staple Sonic series item, are abundant; the player can exchange rings to gain a temporary speed boost or open doors leading to short cuts or special items. "Item Panels" give a random temporary advantage, such as a speed increase or shields that grant abilities such as being able to run across water or attract nearby rings. Collection of other special items, such as "Sonic Tokens" and the Chaos Emeralds, may lead to the unlocking of secret characters. Sonic R allows the player to select the type of weather seen during races. There is also a "Time Attack" mode, where the player races solo to get the fastest time, and a two player competitive mode, increased to four-players in the Gems Collection port. In addition to the standard time trial mode, there are two others: "Get 5 Balloons", where five balloons are scattered across the track and must be located, and "Tag 4 Characters", where the player chases and must catch four others. Sonic R features ten playable racers, each with unique attributes and abilities falling in line with their usual abilities. The title character, Sonic the Hedgehog, is the fastest and possesses the ability to "double jump" (being able to perform a second jump in mid-air). Tails is able to fly through the air for a short time, and Knuckles the Echidna can glide through the air upon jumping. Amy Rose, the last initially available character, drives a car, allowing her to hover over bodies of water and receive extra speed from driving over boost spaces. Secret characters include Sonic's archenemy Dr. Robotnik, who flies in a hovercraft and resists differences in terrain; robotic clones of Sonic (Metal Sonic), Tails (Tails Doll), and Knuckles (Metal Knuckles); Robotnik's robotic assistant EggRobo; and Super Sonic, a faster version of Sonic powered by the Chaos Emeralds. Sonic and Tails are about to take a holiday when Tails notices an advertisement for a "World Grand Prix". While not initially interested, Sonic notices that Dr. Robotnik is also participating in the race, which persuades him to change his mind and enter the race. It is revealed that Robotnik has recently learned of the whereabouts of the rare and powerful Chaos Emeralds, with which he aspires to enslave the world, and the World Grand Prix is actually a trap used to distract Sonic. Knuckles and Amy overhear of Robotnik's plan and decide to compete. Together, the four must balance both winning races and obtaining the Chaos Emeralds to keep them out of Robotnik's reach. After the completion of Sonic 3D Blast in 1996, Sega approached Traveller's Tales about working on another Sonic game, this time being a racing game. Traveller's Tales, who coincidentally had been working on a 3D graphics engine without a purpose at the time, found this to be a logical progression, and accepted the project. Traveller's Tales chose to rebuild a Formula One game they were developing into a Sonic-branded title. Development started in February 1997 as a joint project between Sega's Sonic Team and Traveller's Tales. The game was originally known as Sonic TT (the TT standing for Tourist Trophy). It was first publicly announced as "Phase Two of Project Sonic" (with "Phase One" being Sonic Jam). The schedule was tight, and Traveller's Tales requested more freedom than they had with Sonic 3D Blast. Sonic Team designed the race tracks and the game's general flow, and Traveller's Tales were responsible for the implementation and programming. Each track was inspired by levels from previous Sonic games such as Green Hill and Casino Night, and it was due to the tight schedule that there were only five. 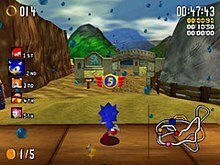 Secret areas and exploration phases were added to follow the series' traditions (Sonic Team also wanted a cross between a racing game and a platforming game), and for this reason a map was developed. Sega of Europe producer Kats Sato handled communication with Sonic Team, as he was the only person who could speak both English and Japanese. Discussions led to the reward mechanisms, which Sato believed broadened the game. The courses' look and feel were inspired by other Sonic games, including Sonic 3D Blast. The 3D models were based on 2D sketches from Sonic Team. All models and animations were developed using Softimage, while Traveller's Tales created their own tools for the remaining game development. Implementing the two-player split-screen mode proved difficult; programmer Jon Burton stated that this was mainly because it was difficult to ensure cheating was not too easy, so shortcuts were made challenging, with a penalty incurred if players got them wrong. A major development goal was to maintain a consistent 30 frames per second frame rate during gameplay. A custom game engine was developed to take full advantage of the Sega Saturn hardware, and a graphical technique, described as "12 layer transparency", was used to transparentise distant textures to conceal the Sega Saturn's limited draw distance. Burton claimed that Sonic R could not have been replicated on other consoles during the timeframe, such as the PlayStation console, due to the technique developed specifically for the Sega Saturn hardware. Environment mapping was achieved by writing what Burton described as a software version of the PlayStation's hardware rendering, as the Saturn's hardware was incapable of it. An early build was unveiled at the Electronic Entertainment Expo in Atlanta, Georgia in June 1997, with Sega releasing screenshots of a "40% complete build" to various magazines shortly afterwards. The builds would be largely the same as the final game, with the exception of minor tweaks, such as the ability to play the "Resort Island" level in a sunset setting, whereas the final game only allowed to alter the weather, not time of day. Traveller's Tales had used programming techniques inspired by those (such as a type of fog known as "Pixie Dust") used on the Nintendo 64. Hirokazu Yasuhara of Sonic Team went to England and fine-tuned the game due to lack of time for communication. Technical and scheduling issues caused Sato to change the game design, leading to a dispute with producer Yuji Naka, and Sato removed his name from the credits. The game's final release would be first in North America on 18 November 1997, with releases in other regions occurring in late 1997 for the Sega Saturn, and into 1998 for the PC version. The PC versions allowed the user to alter graphics details such as allowing to change between software rendering and 3D acceleration or adjusting the game's draw distance, affecting how soon objects in the distance are visible. Like many other previous Sonic games during this time period, a largely unrelated Sonic R game was released as a Tiger Electronics LCD handheld game around the same time in 1998. "Super Sonic Racing", the main theme to Sonic R, was the first track composed for the game. The soundtrack for Sonic R was composed by British composer Richard Jacques of Sega Europe, who had also previously worked on the soundtrack of the Sega Saturn and PC versions of Sonic 3D Blast. Work on the soundtrack began in March 1997 when Jacques travelled to Japan to meet with Sonic creator Yuji Naka to discuss the musical approach to take for the game. The first song written was "Super Sonic Racing," which would be used for the game's reveal in June at E3. British singer TJ Davis provided the vocals for the song, which Naka liked so much that he requested that she be featured in all the game's songs. Jacques wrote all the lyrics for the songs with the intention that they would complement the on-screen action but still be appealing to someone who had never played the game. Tracks were recorded and programmed at Sega Digital Studios, and then worked on for two weeks at Metropolis Studios in London, where a week was spent on vocals, and a week was spent on producing, mixing, and finalising the tracks. Jacques stated that this task was amongst the most difficult in his career because the lyrics needed to "really mean something". Sonic R features two separate mixes of each song in its in-game soundtrack; ones with vocals and instrumental versions, giving the player the option to disable vocals. An official soundtrack CD was released on 21 January 1998. The Saturn version of Sonic R received generally positive reviews from critics at the time of its release, although retrospective commentary has been more negative. It received an aggregate score of 69 per cent from GameRankings, based on six reviews, and the PC version received 70 per cent based on two. The game's visuals were considered its strongest feature. AllGame called the textures vibrant and noted they had "no pop-up or glitching", and Electronic Gaming Monthly (EGM) felt the environmental details were lush. EGM and Sega Saturn Magazine highlighted the consistent frame rate (which rarely dropped below 30 frames per second) as a noteworthy achievement, with the latter favourably comparing Sonic R to the Saturn version of Sega Rally Championship. Next Generation hailed the game as "the most visually outstanding Saturn title" for its use of transparency effects and reflective surfaces, a sentiment echoed by EGM. Sega Saturn Magazine cited the "Radiant Emerald" level, which is made from transparent polygons, as far superior when compared to Mario Kart 64's "Rainbow Road". GameSpot stated that the cartoonish style of previous Sonic games worked well in 3D. GameSpot, EGM, and GamePro criticised the background's graphical "pop-up", with GamePro opining that it ruined the multiplayer mode. However, Sega Saturn Magazine praised the two-player mode for maintaining the same speed and graphical detail as its single-player counterpart. Game Informer asserted that "the way they hid the background pop through translucent melting is innovative", but they panned the poor quality of the character animation. Finally, Sega Saturn Magazine complimented the replay mode's more dramatic camera angles. Critical reaction to the game's level design was also positive. Game Informer found the tracks imaginative and filled with secrets, while EGM and them "some of the most well-designed tracks ever". AllGame, EGM, and Game Informer thought similarly. Sega Saturn Magazine compared the level design to that of the 16-bit Sonic titles and Sonic Team's Nights into Dreams..., noting that "far more fun is to be gleamed [sic] from the exploration element" than "the temptation ... to leg it through each of the levels in a time trial-like way". In a similar vein, Next Generation described Sonic R and Nintendo 64 contemporary Diddy Kong Racing as "less of a racing title and more of a driving adventure game". Sega Saturn Magazine commented on the replay value provided by alternate modes, such as "Get 5 Balloons! ", but conceded that "five tracks don't really suffice, even with the reverse mode". GameSpot, EGM, and Game Informer also expressed disappointment with the limited selection of levels. The title's controls and overall gameplay were criticised, with some questioning their accuracy and depth. GameSpot finished every level in first place within one hour using only one of the four initial characters. While the game also features a hard mode, GameSpot concluded that "Sonic R has more in the personality department than in the depth department". GameSpot and Game Informer cited finding the Chaos Emeralds and hidden coins as difficult, but GameSpot argued that such optional tasks offered little in return, because the hidden characters "are mostly robot versions of the already playable ones". Moreover, AllGame believed the controls took time to get used to, but added: "Start sliding around corners and letting off the gas at the right times and you'll be finding all of the secrets that Sonic R conceals in no time". Likewise, Sega Saturn Magazine called the controls "initially tricky ... but incredibly playable," Next Generation stated "the proper techniques, with time, can be learned," and Game Informer concluded "once you get used to it, you'll find a real solid game". Game Informer thought the game played better with the digital pad as opposed to Sega's analogue controller. GamePro agreed that the controls were responsive, but to a fault: "At high speeds, it's nearly impossible to run in a straight line". Sonic R's soundtrack was particularly divisive. Sega Saturn Magazine described the "storm of controversy [that] surrounds the accompanying music", which "has come in for a bit of a slagging on the Internet recently for the addition of vocals." Although he was not a fan of dance music, Nutter stated that the tracks were "better than most chart stuff", while the included instrumental versions were sufficient "to appease everyone". AllGame offered high praise for the soundtrack, which they called "One of the most inspired ... I've ever heard", while GameSpot believed the songs gave the game so much more personality". Conversely, GamePro deplored the music as "unbelievably annoying". Computer and Video Games complimented the music, saying it "fits the Sonic style perfectly", and is reminiscent of Sonic CD's soundtrack. The ported version of the game available in Sonic Gems Collection was more negatively reviewed. Eurogamer called the game "too awkward to play for any length of time", and 1UP.com wrote the visuals were grainy—"mak[ing] it hard to tell where you're going"—and the controls were frustrating and imprecise. GameSpot described "its laughably bad soundtrack" as "[its] only redeeming quality", and GameSpy called Sonic R "a concept that works better in theory than in practice"—despite its "fantastic (if not bizarre) soundtrack". Conversely, Jeuxvideo.com, in a negative review of Sonic Gems Collection, praised the game, arguing that it was the only decent game in the compilation alongside Sonic CD. In a 2003 retrospective, Game Informer described the game as "decent, but unmemorable", while GamesRadar included Sonic R in a 2014 list of the top 50 Sega Saturn games, calling it "a technical tour de force". GameTrailers ranked it as the second worst Sonic game, behind 2006's Sonic the Hedgehog. Game designer Hirokazu Yasuhara, who helped Traveller's Tales rework the game in response to concerns over the quality of a preview version, has maintained that "the final version of Sonic R is actually quite good ... However, I do admit that the base concept of Sonic R, in which a player 'drives' running characters, is not great". Despite Sega releasing two Sonic racing games prior to Sonic R, Sonic Drift and Sonic Drift 2, for the Sega Game Gear, developer Takashi Yuda cited fans requesting more racing games in the vein of Sonic R would be Sega's actual inspiration for revisiting the genre in future years. This led to the development and release of the hoverboarding game Sonic Riders, although there are no connections between the two games other than both being racing games. Later Sonic racing games include Sonic Riders sequels Sonic Riders: Zero Gravity and Sonic Free Riders, and kart games Sonic & Sega All-Stars Racing and Sonic & All-Stars Racing Transformed. Songs from Sonic R's soundtrack were included in later games featuring Sonic in their original forms or as remixes. Super Smash Bros. Brawl, a fighting game for Nintendo's Wii console, features the song "Super Sonic Racing" as background music for its Green Hill Zone stage. Music was also featured in games such as Sonic Generations and Sonic & Sega All-Stars Racing. ^ Japanese: ソニックR (アール), Hepburn: Sonikku Āru? ^ "セガハード大百科 セガサターン対応ソフトウェア（セガ発売）" [Sega Hardware Encyclopaedia Sega Saturn Software (Sega releases)]. Sega (in Japanese). Retrieved 25 August 2016. ^ "Sonic R Review". Gamerevolution.com. 4 January 2013. Retrieved 10 January 2013. ^ Official Guide, p. 31 . ^ Buchanan, Levi (20 February 2009). "Where Did Sonic Go Wrong?". IGN. Archived from the original on 22 June 2018. Retrieved 10 January 2013. ^ Theobald, Phil (15 August 2005). "GameSpy: Sonic Gems Collection – Page 2". Cube.gamespy.com. Archived from the original on 22 June 2018. Retrieved 10 January 2013. ^ "Sonic Gems Collection Review". GamesRadar. 25 February 2006. Archived from the original on 22 June 2018. Retrieved 10 January 2013. ^ a b c d e f g h i "Travellers Tales: Sonic R Programmer Speaks!". Sega Saturn Magazine. No. 24. EMAP. October 1997. p. 25. ISSN 1360-9424. Retrieved 25 August 2016. ^ a b c d e f g h Sackenheim, Shawn (3 October 2010). "Sonic R – Review". allgame. Archived from the original on 14 November 2014. Retrieved 25 August 2016. ^ a b c d e f g h i j MacDonald, Ryan (22 December 2007). "Sonic R Review for Saturn". GameSpot. Retrieved 16 June 2014. ^ "Sonic R © Sega PC". Gaming Entertainment Monthly. 20 February 1999. Archived from the original on 5 March 2003. Retrieved 25 August 2016. ^ Official Guide, p. 33. ^ Official Guide, pp. 10-24. ^ Official Guide, p. 22. ^ "ソニックR" [Sonic R] (PDF). Sega Saturn Magazine (in Japanese). Vol. 45 no. 81. SoftBank Publishing. December 1997. pp. 180, 181. Retrieved 25 August 2016. ^ Jon Burton (27 November 2017). Sonic R's F1 History Recovered - And a Surprise Find. GameHut. Retrieved 20 May 2018 – via YouTube. ^ a b c d "The Making Of: Sonic R". Retro Gamer. No. 139. Bournemouth: Imagine Publishing. pp. 64–67. ISSN 1742-3155. ^ Nutter, Lee (July 1997). "A Blast from the Past!". Sega Saturn Magazine. No. 21. Emap International Limited. p. 39. ^ a b c d e Les Editions Pix'n Love, ed. (2013). The History Of Sonic the Hedgehog. Ontario: UDON Entertainment Corp. pp. 62–65. ISBN 978-1-926778-96-9. ^ GamesTM (2011). "Tales of Traveller's Tales". Retro Volume 4. Bournemouth: Imagine Publishing. pp. 129–133. ISBN 978-1-9082-2230-5. ^ "Blue Is Back Again! Race Around Moebius! [sic]". GameFan. No. 11. November 1997. p. 126. ^ Jon Burton (29 November 2017). Sonic R's "Impossible" Effects - How We Made them Possible (Coding Secrets). GameHut. Retrieved 20 May 2018 – via YouTube. ^ a b "Sonic R Sega takes Sonic on the road". Game Informer. No. 54r. GameStop. October 1997. p. 61. ISSN 1067-6392. Retrieved 25 August 2016. ^ "Sonic R (Tiger Handhelds)". RF Generation. 13 July 2012. Archived from the original on 22 June 2018. Retrieved 10 January 2013. ^ a b c d e f "Crack Tracks by Richard Jacques!". Sega Saturn Magazine. No. 25. EMAP. November 1997. p. 71. ISSN 1360-9424. Retrieved 25 August 2016. ^ "Sonic R – A Soundtrack Story". SegaBits. 21 November 2014. Archived from the original on 22 June 2018. Retrieved 25 August 2016. ^ Official Guide, p. 112. ^ a b c d e f g h i j EGM Staff (February 1998). "Sonic R Review". Electronic Gaming Monthly. Vol. 10 no. 103. p. 112. ^ a b c d Dan Elektro (February 1998). "Pro Review: Sonic R". GamePro. Vol. 10 no. 103. International Data Group. p. 98. ISSN 1042-8658. Retrieved 25 August 2016. ^ Suciu, Peter. "Sonic R". GamePro. Archived from the original on 31 December 2009. Retrieved 8 June 2010. ^ a b c d "Head Spin". Next Generation. Vol. 4 no. 38. Imagine Media. February 1998. p. 115. ^ a b c d e f g h i Nutter, Lee (December 1997). "Sonic R Review". Sega Saturn Magazine. Vol. 3 no. 26. EMAP. pp. 50–53. ISSN 1360-9424. Retrieved 25 August 2016. ^ a b "Sonic R for PC – GameRankings". GameRankings. Retrieved 18 June 2010. ^ a b "Sonic R for Saturn – GameRankings". GameRankings. Retrieved 18 June 2010. ^ a b "Sonic R" (PDF). Computer and Video Games. No. 193. Future Publishing. pp. 72–76. ISSN 0261-3697. Retrieved 25 August 2016. ^ Bramwell, Tom (6 October 2005). "Sonic Gems Collection Review • Reviews • GameCube •". Eurogamer.net. Archived from the original on 22 June 2018. Retrieved 16 June 2014. ^ Parish, Jeremy (16 August 2005). "Sonic Gems Collection". 1UP.com. Archived from the original on 19 February 2013. Retrieved 17 February 2017. ^ Davis, Ryan (24 August 2005). "Sonic Gems Collection Review". GameSpot. Archived from the original on 22 June 2018. Retrieved 21 July 2014. ^ Theobald, Phil (15 August 2005). "GameSpy: Sonic Gems Collection – Page 1". Cube.gamespy.com. Archived from the original on 22 June 2018. Retrieved 16 June 2014. ^ Superpanda. "Test Sonic Gems Collection sur PS2". Jeuxvideo.com (in French). Retrieved 13 June 2018. ^ a b Staff (August 2003). "Sonic's Architect: GI Interviews Hirokazu Yasuhara". Game Informer. Vol. 13 no. 124. GameStop. pp. 114–116. ISSN 1067-6392. ^ GamesRadar Staff (6 March 2014). "Best Saturn games of all time". GamesRadar. Retrieved 16 June 2014. ^ "GT Countdown – Top 5 Worst Sonic Games". GameTrailers. IGN. 27 October 2013. Retrieved 25 August 2016. ^ a b Theobald, Phil (20 January 2006). "GameSpy: Sega Talks Sonic Riders – Page 1". Ps2.gamespy.com. Archived from the original on 22 June 2018. Retrieved 10 January 2013. ^ Sakurai, Masahiro. "Full Song List with Secret Songs – Smash Bros. DOJO!!". Smash Bros. DOJO!!. Nintendo. Archived from the original on 9 May 2013. Retrieved 25 August 2016. ^ "SEGA Tunes: Sonic R's Super Sonic Racing". SegaBits. 1 May 2012. Archived from the original on 22 June 2018. Retrieved 25 August 2016. SoftBank (24 December 1997). ソニックRオフィシャルガイド Sonikku āru ofisharu gaido [Sonic R Official Guide] (in Japanese). Tokyo: Sega Enterprises. ISBN 978-4-7973-0516-6. This page was last edited on 6 April 2019, at 18:54 (UTC).